PHOTO BY ANNETTE DRAGON James Heath as David Hochstein and Kate Osher as Ernestine in "BRAVURA: The Life and Death of David Hochstein." "BRAVURA: The Life and Death of David Hochstein"
Directed by Donald B. Bartalo, "BRAVURA: The Life and Death of David Hochstein," presented by the Multi-use Community Cultural Center and Hummingbird Theatre Co., is the latest in a recent string of biographical plays featuring prominent historical Rochesterians. And if the success of "Revival: The Resurrection of Son House" and "The Agitators" is any indicator, playwright Stuart Loeb's theatrical profile of Hochstein will resonate with local audiences. The play tells the story of the gifted violinist who was tragically killed during World War I at the age of 26, and whose name is now synonymous with meaningful music education in Rochester. But there are inherent inconsistencies in the story which ultimately undercut a well-written script, a particularly compelling first half, and a commanding performance from actor James Heath as the title character. The result is a promising play that can't seem to decide whether to be a complex study of a young man choosing between his life's calling and his sense of moral obligation, or a sobering essay on the destructiveness of war. Smartly constructed as a series of vignettes in predominantly chronological order, "Bravura" centers on David Hochstein's fateful decision to enlist the army and fight overseas in World War I. He refuses to change his mind, even after receiving a deferment to stay home, attend to his mother, and pursue his burgeoning musical career as a dynamic violin soloist. A character simply called "Boy," played with sincerity and pathos by Reece Gurell, accompanies the adult Hochstein throughout the play. The child is clearly a tangible metaphor for the lost promise of Hochstein's youth, with whom the adult Hochstein is having an internal conversation. But the play contradicts itself when the character of George Eastman, played by David Byrne, acknowledges the boy's physical presence. Hochstein eventually makes the seemingly inexplicable choice to join the war effort. We get closest to understanding what motivated Hochstein in an especially poignant mini-monologue, in which he challenges us to imagine great composers deprived of their character: Beethoven, without valor; Tchaikovsky, without passion; and Mozart, without joy. Voiced with conviction by Heath, the beleaguered yet resolute Hochstein declares: "There is no harmony in a world of evil and wrongdoing." Here, we see an artist so distraught by the horrors of reality that he feels the only response is to fight them head-on, in hopes that he can help to make the world a place where music makes sense again. With energetic pacing and dialogue that crackles with wit and warmth, Hochstein interacts with the people closest to him -- his loving mother Helena (Denise Bartalo), his iconoclastic, anarchist aunt Emma Goldman (Stephanie Roosa), his would-be wife Ernestine (Kate Osher), the violin teacher Leopold Auer (Byrne) -- and they all urge him not to go off to war. In the first two acts of the play, Loeb provides the crux of the conflict: how can Hochstein reconcile his immense musical talent and his responsibility to those who are emotionally invested in him with his own sense of duty? This tension is most effective in the relationship between Hochstein and Ernestine, as their obvious love and affection for one another is tested by the war. 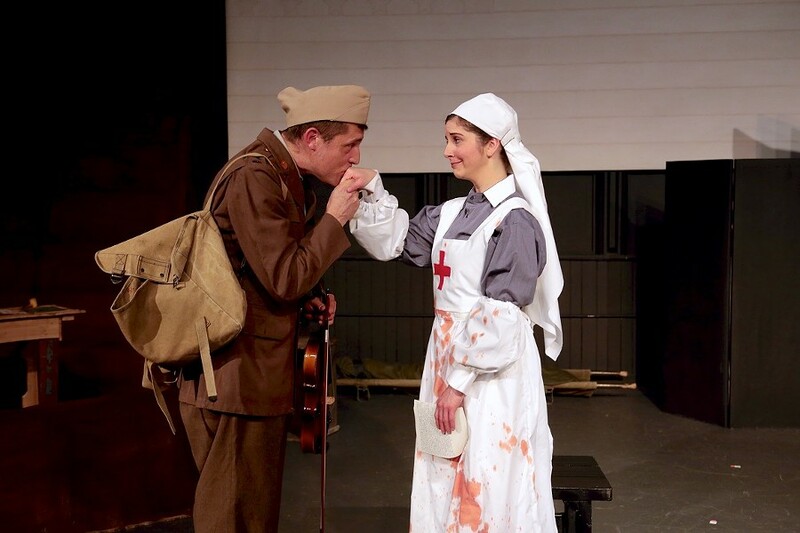 Osher's portrayal of love interest-turned-army nurse Ernestine is subtle and nuanced, with a full dramatic range that makes believable the character's transition from provincial innocence to desperation and the wisdom that comes from abject loss. Heath and Osher have a touching chemistry, tragically demonstrating a romance interrupted by war. Similarly, the play itself seems interrupted. Once Act III begins, and the finality of Hochstein's decision to fight sets in, the tone shifts dramatically. What was a fascinating look at a man at a crossroads becomes an unrelenting war epic, in which Hochstein's distinctive life and values are consumed (perhaps fittingly) by the Great War. While this shift is understandable, it feels as if the audience is watching two plays. Whereas the first play presents a clear plot construction and an intriguing moral conundrum, the second play is dragged down by its own heavy-handedness. In its admirable attempt to demonstrate the devastating death toll that war exacts, Loeb's drama becomes stuck in a morass, in which the ultimate message of the play is obscured. To its credit, "Bravura" doesn't make a moral judgment on Hochstein, and it doesn't tell the audience how it should feel about the musician's fateful choices. But the play doesn't offer a consistent perspective on this matter, either. On the one hand, the audience is meant to laud Hochstein's bravery and heroism. On the other hand, virtually all of the play's other characters insist on the error of his decision, which paints him as well-intentioned but ultimately misguided, foolish, and even reckless. One especially heartbreaking scene shows Hochstein, now a lieutenant, symbolically charging into battle with his men, violin in hand. In the end, are we to praise Hochstein's actions as "right," or decry war and the way it indiscriminately snuffs out lives such as Hochstein's? Perhaps we're meant to feel both, but the ambiguity takes away from any larger takeaway, particularly as it pertains to the Rochester musician's legacy.